HOW MUCH DIRT DOES X-RAY DIG A DAY? 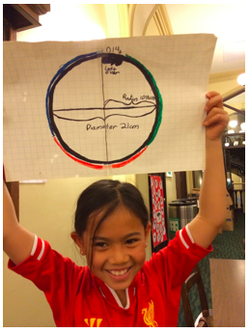 Editor's Note: Three Lower School students, Sam, Sam, and Sophie, worked with teacher Christopher Natalie to solve a problem concerning the the volume of a cylinder, without ever having heard of pi or knowing the equation for the volume of a cylinder! Stanley’s shovel is five feet long. In the story, the character Mr. Sir tells the boys “The shovel is your measuring stick.” He also tells them that the hole has to be five feet in diameter and five feet deep. The shovel that the character X-Ray used was shorter than all the rest, but we didn’t know how much shorter. We imagined that X-Ray’s shovel was four feet and eight inches long, so he makes a smaller hole. But how much smaller????? We needed to know how to find the volume of a cylinder, but didn’t know how. We discussed how to find the volume of a cube and to apply that knowledge to a cylinder. We know that we can find the volume of a cube by finding the area of a square and then multiplying it by the height of the cube. So, we knew that we had to find the area of a circle. How, though? When you add sides to a square, one at a time, it gets more and more “circle-like”. We played around with cutting a circle into a bunch of triangles. They weren’t triangles at first, though, because the base of the shape was round. It looked more like a slice of pizza, not a triangle. But, when we cut it into more and more triangles, the base became a straighter line. We knew that we could cut one of the triangles in half, move one of those halves to the other side and it would become a rectangle. The area of a rectangle is found by multiplying the length times the width. How did we use this information to find the area of a circle? One of the sides of that rectangle, was really the circumference in disguise. The other side was the radius in disguise. That meant, if we could find the circumference of the circle and multiply it by the radius, we’d have the area of the circle. This was the easy part. The radius is half of the diameter. We knew that the diameter was 60” (5 foot long shovel). Half of that is 30 inches. We explored the relationship between the circumference of a bunch of different circles and their diameters. We realized that, when you take a piece of string as long as the diameter, and wrap it around the circumference of that circle, it always goes 3 times, with a little more left over. We discussed this with Mr. Natale and learned that this relationship is known as pi (π). For any circle, you can wrap the diameter around the circumference about 3.14 times. Then to find the area we had to do radius x1/2 circumference. The radius was 30 inches. Half the circumference is 94.2. So we did 30x 94.2 =2826! To find the volume we multiplied the area of the circle by the height of the hole [60in.] and 60 x 2,826 = 169,560sqin. The answer of how much dirt Stanley digs in day! How much less does X-Ray dig? We did the same thing for X-Rays hole. The diameter was 56in. 56 x 3.11 = 175.84. 175.84 is the circumference. Half is 87.92. To find the area we multiplied the radius [28in] by 87.92 which equals 2,461.76sqin. We did the area x the diameter which equals 137,858.56sqin. And that’s how much dirt X-ray digs a day.